Write very short answer to the following questions. 1. Write down any two expenditure heads included in total cost. 2. What is international market? 3. What happens to real wage when the price of the commodity increases? 4. What is meant by Development bank? 5. Write down any two sources to maintain deficit budget by the government. 6. What percentage of extra wage should be paid to the labour in capitalist sector than subsistence sector, according to Laws? 7. What is meaning by dualistic economy? 8. English any two goods that are major exportable from Nepal to other country. 9. What is meant by subsistence agriculture economy? 10. Though Nepal receives sufficient remittance from foreign employment, it has not been utilized properly. Suggest any one idea to utilize it. 11. Fill the appropriate value in the blank space of the table given below, then construct suitable diagram for AR and MR.
Write long answers to any three of the following questions. 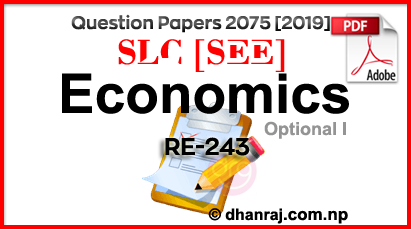 0 Response to "Optional I Economics Question Paper | 2075  | RE-243 | SEE"